Diesel engines are the major source of power for various machines which are utilized in construction, agricultural, automobile and industrial verticals. Major application equipment includes tractors, passenger vehicles, gensets, commercial vehicles, diesel locomotives and construction equipment. According to 6Wresearch, India diesel engine market size is projected to grow at a CAGR of 4.9% during 2018-23. In India, major demand for diesel engines is generated from automotive industry due to growing demand for passenger vehicles in domestic and export market. Further, growing retail & logistics industry in the country is also contributing to the increase in sales of commercial vehicle, thus driving diesel engine market. Commercial vehicle segment would drive the India diesel engine market forecast revenues due to high demand for trucks and buses in the country. Further, agricultural sector is the second largest consumer in value terms due to high utilization of diesel engines in farm equipment. With farm mechanization rate at just 40%, India is expected to witness growth in demand for self-propelled farm equipment during the forecast period. Decreasing labor availability and increasing labor cost would also lead to growth in farm equipment. Amongst all, 31-100 Hp diesel engines accounted for majority of India diesel engine market share in both revenue and volume terms. Passenger vehicles, tractors and construction equipment are the key revenue generating segments. However, diesel pump and diesel passenger vehicle markets, which are major consumers of diesel engines are expected to witness slowdown due to improved power supply position and hike in diesel fuel prices in India. Further, among all the regions, the Northern region accounted for highest revenue share in FY2017. Market is expected to surge on account of growing commercial vehicle market and growing exports of diesel based equipment. The India diesel engine market report thoroughly covers the diesel engine market by type, applications and regions. 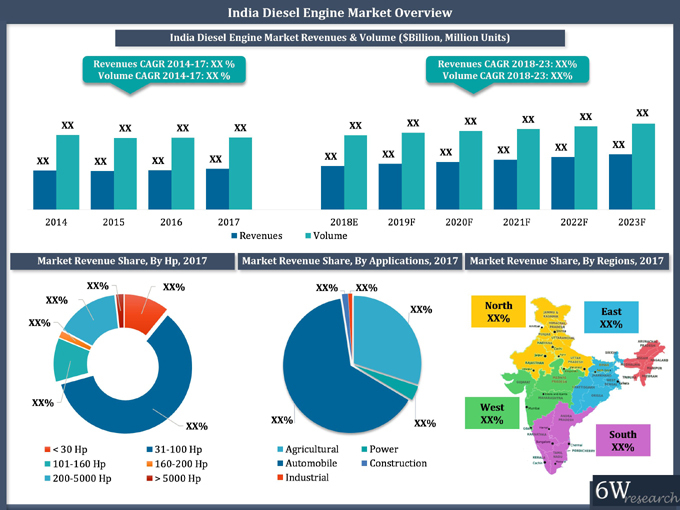 The India diesel engine market outlook report provides an unbiased and detailed analysis of the on-going India diesel engine market trends, opportunities/high growth areas, market drivers which would help the stakeholders to device and align their market strategies according to the current and future market dynamics. 15.1	Kirloskar Oil Engines Ltd.
15.2	Mahindra & Mahindra Ltd.
15.4	MHI VST Diesel Engines Pvt Ltd.
15.5	Simpson & Co. Ltd.